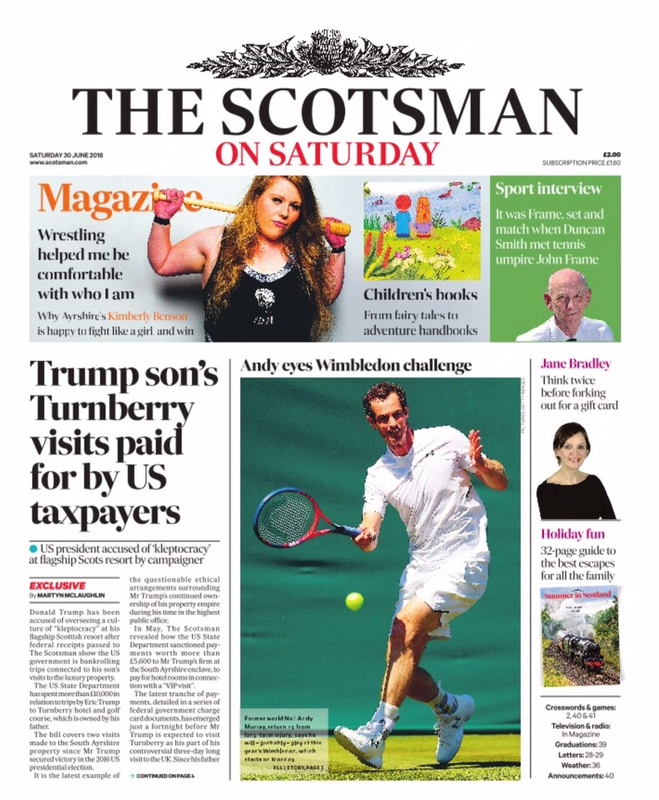 Donald Trump’s son linked to £10,000 US State Department payments to Turnberry resort – from The Scotsman – A exclusive into how the US government has bankrolled trips to Donald Trump’s Turnberry resort by his son, Eric Trump. Donald Trump has been accused of overseeing a culture of “kleptocracy” at his flagship Scottish resort after federal receipts passed to The Scotsman show the US government is bankrolling trips connected to his son’s visits to the luxury property. The US State Department has spent more than £10,000 in relation to trips by Eric Trump to Turnberry hotel and golf course, which is owned by his father. The bill covers two visits made to the South Ayrshire property since Mr Trump secured victory in the 2016 US presidential election. It is the latest example of the questionable ethical arrangements surrounding Mr Trump’s continued ownership of his property empire during his time in the highest public office. The latest tranche of payments, detailed in a series of federal government charge card documents, has emerged just a fortnight before Mr Trump is expected to visit Turnberry as his part of controversial three-day long visit to the UK. Since his father became the 45th president of the US, Eric Trump has assumed responsibility for overseeing the Trump Organisation’s sprawling global portfolio of high-end golf resorts. He has visited Turnberry several times since his father’s election, but the charge card documents, obtained by The Scotsman from Property of the People, a Washington-based organisation which campaigns for government transparency, marks the first time federal payments can be linked to his Scottish trips. The records show that the State Department spent $7,724 (£5,878) of taxpayers’ money on 6 April last year for hotel accommodation at Turnberry. The payment was made a few days in advance of Eric Trump’s visit to the resort in order to to check up on the progress of its King Robert the Bruce course, which opened that July. The charge card documents do not offer a breakdown of the expenses or the duration of the trip, but at the time, Mr Trump’s second son made no secret of his April trip. He also gave an interview to the local Ayrshire Post newspaper to promote the “truly incredible” King Robert the Bruce course. It is understood Eric Trump’s visit at the time was part of a whistle-stop tour of Trump properties. The charge card documents show the State Department paid $10,386 (£7,903) on the same date as the Turnberry payment for “hotel accommodation” to “support E Trump visit” at the Trump Doonbeg resort in Co Clare, Ireland. That month, the Irish Times newspaper ran an interview with the 34-year-old, which stated that he had flown in to Ireland from Turnberry on 11 April. The documents obtained by Property of the People also show the State Department made a payment of $5,583 (£4,248) on 29 November 2016 – just three weeks after Mr Trump’s historic election victory – for accommodation at Turnberry. At that time, Eric Trump did not publicise his visit to Scotland, but social media posts show he flew on a commercial airline from New York’s Newark Airport to Glasgow Airport around that date. An Instagram post shared by his fellow passenger, Mo Amer, a US stand-up comedian of Palestinian descent, showed the two men seated side by side on the flight. A source at Turnberry said Eric Trump’s visit at the time lasted just 24 hours. Although the charge card documents do not specify the recipients of the State Department spending at Turnberry, the same department’s £5,645 payment for the “VIP visit” to the resort earlier this year was made to SLC Turnberry. The company remains under the ownership of Mr Trump. Its directors include Eric Trump and Donald Trump Jr, the president’s eldest son. That payment was authorised by the State Department’s bureau of European and Eurasian affairs – which is responsible for developing and implementing US foreign policy – and processed via the US Embassy in London. A ProPublica report, published on Wednesday and based in part on the same government expenditure records obtained by The Scotsman, claims that since Mr Trump announced his candidacy for the presidency in 2015, Trump Organisation-managed and branded properties have received at least $16.1m (£12.2m) from US government agencies, Mr Trump’s presidential campaign, and Republican organisations. At least $400,000 (£304,000) of that total, the online news site claimed, has been spent by federal, state and local agencies. 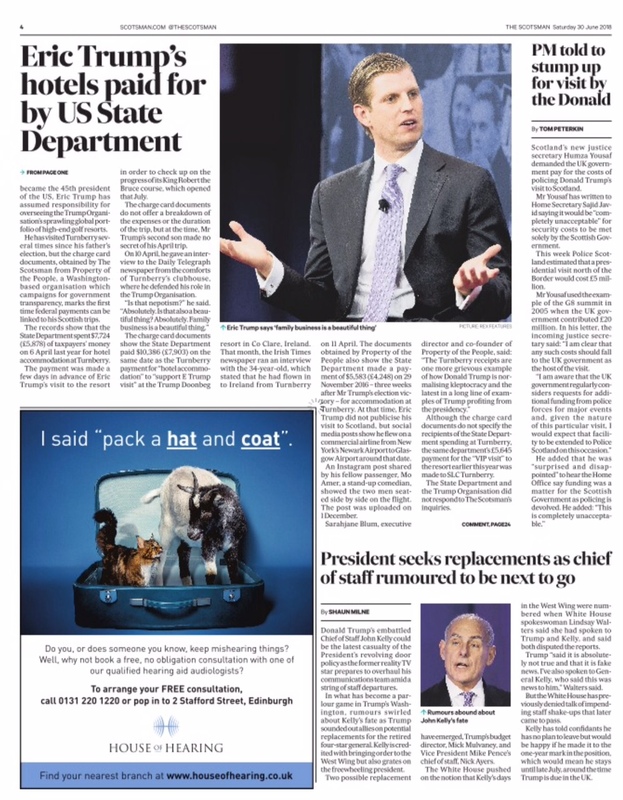 The State Department and the Trump Organisation did not respond to The Scotsman’s enquiries.